The release of Microsoft’s Windows 10 Operating System has been one of the most eagerly anticipated in the companies history – not only does it usher in the age of DirectX 12, but also brings in a plethora of new features and goes back to a more desktop PC and power-user friendly GUI. Unfortunately, news of Microsoft’s recent updates to both their Privacy Agreements and Terms of Service has certainly killed some of the W10 hype, with the updated privacy notice giving Microsoft a rather unhealthy and frankly creepy insight into your personal and online space. Fortunately there are ways to help put you back in the driving seat of your own privacy settings – but it’s going to require a bit of work on your part, but when you read “We will access, disclose and preserve personal data, including your content (such as the content of your emails, other private communications or files in private folders), when we have a good faith belief that doing so is necessary to”, for example, “protect their customers” or “enforce the terms governing the use of the services,” it’s certainly good motivation. If you’re uncomfortable with the above, then you’ve come to the right place. The first and easiest step is to have a local Windows 10 account, not one associated with Microsoft’s cloud services. 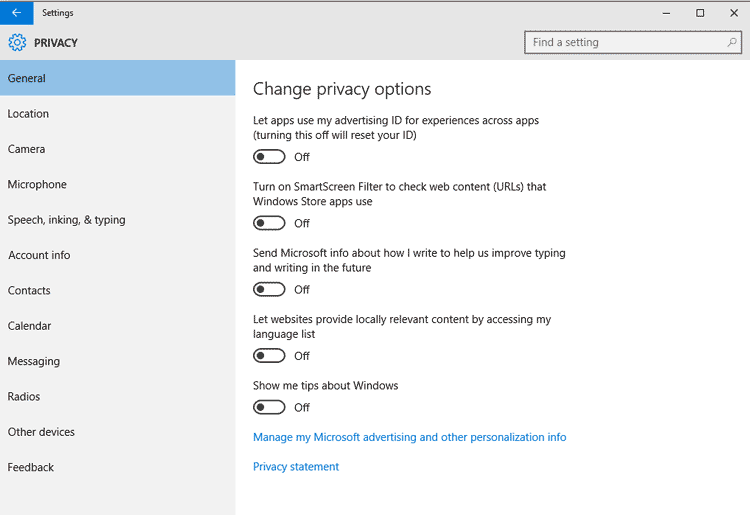 During the initial Windows 10 setup, you might find Microsoft heavily suggest this isn’t a good idea, but it’s really the best way of reducing the amount of info Microsoft collects about you. After that, you need to head over to privacy settings: Click start -> type Privacy and then load up privacy settings. There’s little reason to leave any of the default settings “as is” – go through each of the privacy settings one by one and disable their monitoring. As you can see above terms such as “Send Microsoft info about how I write to help us improve typing and writing in the future” and “Let apps use my advertising ID for experiences across apps” doesn’t really bring out a great deal of user confidence. After you’ve go through the various tabs, such as General, Location, Camera, Contacts, Microphone and so on, we need to turn our attention on to Project Spartan. I would highly suggest you don’t use Project Spartan and instead use something like FireFox or Chrome, but it’s worth disabling the (alarming) privacy problems with Spartan first, just in case an application loads of Spartan by default. So once again on the W10 desktop, type “Spartan” to load the application, then click on the “…” on the right right corner, settings and then advanced. 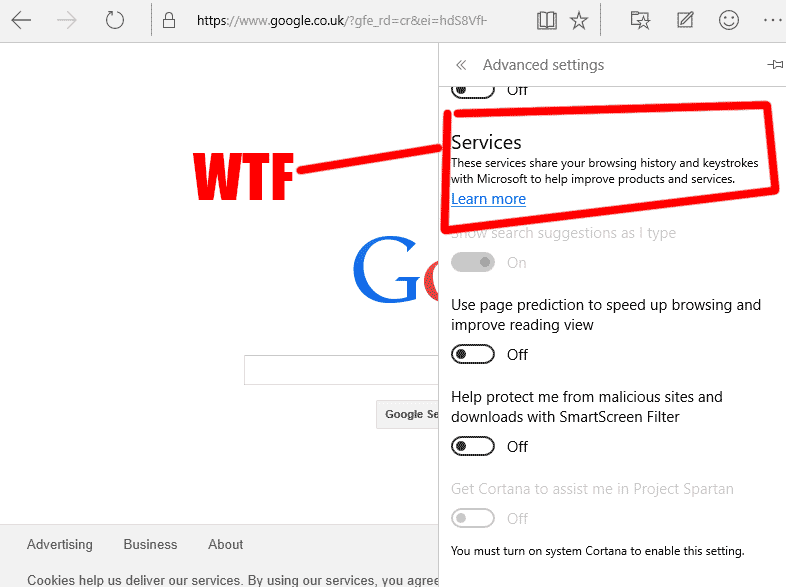 I think the highlighted text above “These services share your browsing history and keystrokes with Microsoft” says it all really. It’s a crazy this stuff is on by default – and if nothing else is potentially a massive security flaw in the future. Next, click start and type in “command” -> right click Command Prompt and -> Run as Admin. You’ll get a good old fashion dos Command prompt window where you need to type out the following commands in order. If you’ve done everything correctly, re-entering the command will get you an error message telling you that the service isn’t working. Now, we need to start our work in Group Policy: Windows + R -> gpedit.msc -> okay. We’ve two tasks while we’re here, the first is disabling the storage of files in OneDrive. 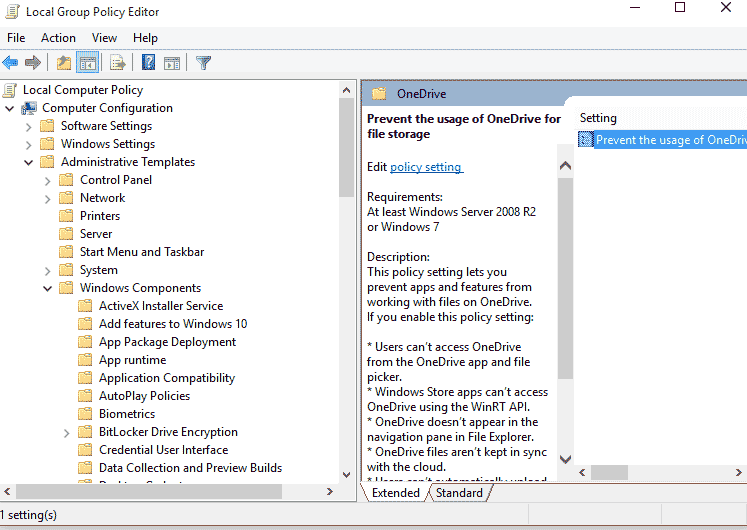 To do this, click on Computer Configuration -> Administrative Templates -> Windows Components -> OneDrive -> right Click -> Prevent the usage of OneDrive for File Storage -> Okay. With the window still open, we need to disable Windows 10 Telemetry. The problem is that it’s a lot harder to disable on non-enterprise versions of the Operating System, with even the lowest setting sending over limited data to Microosft. We can fix this, but requires a bit of effort. First things first -> Computer Configuration -> Administrative Templates -> All Settings -> Allow Telemetry -> Disabled. If you’re running Windows 10 enterprise, that’s all you need to do to stop Telemetry, but if you’re running a home version of Windows 10, you’ve got to follow these steps too: Start+R -> Regedit -> HKEY_LOCAL_MACHINE -> SOFTWARE -> MICROSOFT -> WINDOWS -> CURRENT VERSION -> POLICIES -> DATACOLLECTION. Double click on AllowTelemetry and change the value from “1” to a “0”. This article was filed under Articles, Features, Gaming News, Hardware, PC Gaming News, Software, Tech News. Tagged with DirectX 12, DX12, operating system, PC gaming, privacy, windows 10, windows 10 security.